Two-track roads and tobacco barns. Self-reliance and rustic charm. In North Carolina, “country” is both how we live and the place we call home. During an election season, any reference to “the country” has an immediate association with The Country. As in, the United States. In England — heck, even in Charlottesville or Charleston — “the country” means something entirely different, having to do with spaniels and hunt clubs and plus-fours, whatever those are. But for North Carolinians, “the country” is decidedly lowercase. North Carolina is covered in country. Most of the mountains is country, and a whole lot of the east is country, but there’s country just outside Monroe and Statesville and Sanford, too. You can tell you’re in the country when you see tobacco barns, birdhouses made from gourds, and fields fenced in with weathered split rails. I love being in the kind of country where a crop grows right up to the front steps — and abuts the other three sides — of a farmhouse. In the country, you’re likely to be held up by Sunday drivers, and see hand-lettered signs on the roadside, like PIK-UR-OWN, or one that made me weep: SLOW, DEATH IN FAMILY. If you’re lucky, you’ll spot a whitewashed tractor tire planted with petunias, or a dumb-like-a-fox mule. As a child, passing a pigsty was the biggest thrill of riding out in the country. A moment for a grammar and lingo lesson: Country takes a preposition. You live out in the country, for example. You go riding out in the country. North Carolinians don’t typically speak of “the countryside.” And those pigsties didn’t look a thing like Wilbur’s pen in Charlotte’s Web, either. Still, country tends to be more adjective than noun. Country stores are live bait and hoop cheese and metal watering cans. (Sometimes, a country store is all there is to a country town.) Country roads are dirt and gravel and corduroyed ruts. Country cooking can be fried in fat, fresh from the field, or canned in the cellar. Country decorating is red-checkered tablecloths and pie safes and cross-stitched samplers. Country people are farmers and philosophers, rednecks and writers, preachers and people just fleeing other people, or some combination of them all. 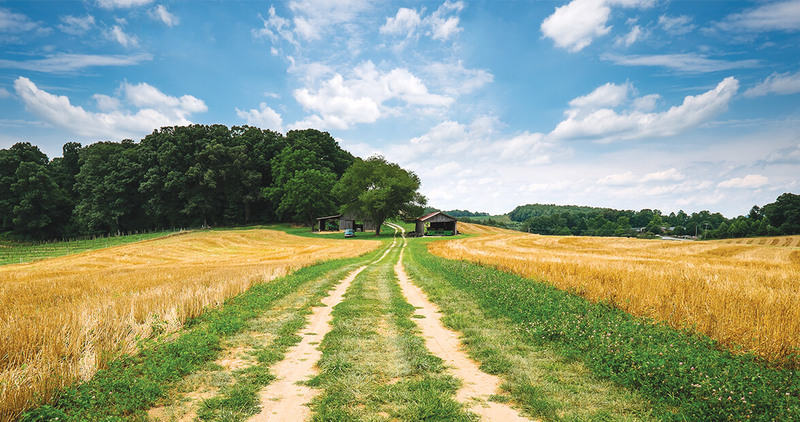 Country used to mean homey and homespun and homemade, and that image has become a marketing tool — “country-style” — with country-style restaurants and ribs, and country-style boots and bib overalls. “Country come to town” was how my father teased me as I was growing up and adopting the ways — language, clothing, mannerisms — of my city friends, but these days, “country cousin” is probably a compliment. That’s because the word “country” has come to mean not just a place to live, but a way of living. One that means less time in stores and more time outside. Less dependence and more self-reliance. Less digital connectedness and more deliberate disconnections. Less throw-it-away-and-get-another, and more fix-it-up-and-keep-it-running. A way of thinking, and being, that involves elbow grease, and elbow room. Sure, country means more space between stop signs and mailboxes and human beings (except for country cemeteries, which are lovely things to come upon), but it also means something and somewhere less commercialized, less processed, less public. Even if it’s only on your fork or your radio, now and then everyone needs a little country.